Given Sunseeker’s global status as a luxury motoryacht manufacturer, you might expect the firm to have been conceived in the shed of an ambitious boat builder. But in fact it was in a car dealership that Sunseeker began. Friar’s Cliff Motors, a Ford motor dealership owned by John Macklin, did a sideline in boat sales. In 1960, Friar’s Cliff Marine was incorporated. Unbeknown to those involved, a nautical sideline was to grow into one of the world’s biggest brands. During the 1960s, while the company still sold boats built by others, Friar’s Cliff Motors morphed into Poole Power Boats. Shortly after, a dramatic turn of events changed the direction of the firm forever. In 1969, the American boat builder Owens (whose yachts Poole Power Boats sold) decided that they would no longer distribute to Europe and announced their decision to close the UK operation down. Young salesman Robert Braithwaite saw an opportunity, so he raised some cash, drove to the Owens’ offices in Arundel, negotiated a deal, and acquired their mould. Having never built any craft before, Poole Power Boats embarked on the business of boat building. The rest, as they say, is history. Attracted by the Mediterranean market and with an idea of how the boats should perform and look, they approached one of the UK’s leading boat designers, Don Shead, for help with the below-the-waterline physics of an advanced hull design. As Sunseeker developed its first high performance boats, a ‘house style’ began to emerge. Angular shapes on the superstructure matched the high decks and steep-chined hulls. You could now recognise a Sunseeker. In the 1980s, style became as important as performance. Influenced by the car industry, they introduced softer shapes. By the 1990s, a new confidence was evident in the launch of a number of distinctive boats and models in all four ranges: Performance, High Performance, Flybridge and Offshore Cruisers. As the century drew to a close, Sunseeker continued to make advances in styling and design, increasingly influenced by advanced composite materials and new construction techniques. 2001 saw the launch of the 105 Yacht, the first British-built production boat to win two of the world’s most prestigious International Superyacht Design awards. 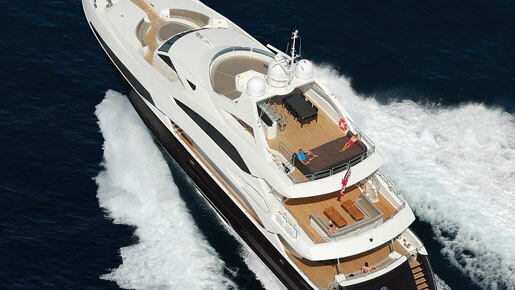 In 2007, the company moved into the superyacht league with the 37 metre yacht. Its performance and ease of handling is matched by extreme levels of comfort with spacious, sumptuous accommodation. Today, Sunseeker continues to make substantial investments in the future, through improved plant and machinery, computerised design, manufacturing systems and in training and motivating its 2,400 strong workforce. In 2007, it was awarded a Queen’s Award for Business, recognition of an increase in exports of over £50m in three years. The award, the fifth Sunseeker has won, bears testament to the hard work of both staff and the dealers, who now operate in over 40 countries worldwide. In fact 98 percent of the vessels manufactured in its Poole and Portland factories end up abroad, with Sunseeker yachts now sold in 61 countries and five continents. You are now as likely to see the boat’s graceful lines in the Mediterranean, as you are in the Indian or Pacific Oceans. Sunseeker’s insistence on investing in the future is always best seen in the new vessels that regularly leave its factories in the south of England. The latest – the all new Predator 115 and the all new Manhattan 73 – will be launched at the Tullett Prebon London International Boat Show 2011. Expansive aft cockpit, flybridge and foredeck social areas provide endless entertainment opportunities, whether the vessel’s in full bore passage making or at-anchor party mode. The spacious full beam master stateroom is a stunning feature, more often seen on yachts much larger in size. A further four guest cabins are incorporated on the lower deck – two doubles and two twins, each featuring the large panoramic trademark ‘organic’ portlights which provide a wealth of natural light. There is an option for balconies on either side of the main deck saloon consisting of sliding patio doors and hinge-out bulwark sections, which open up magnificent seascapes and bring in more natural light. The Predator 115 has been built to RINA pleasure craft classifications, with optional MCA LY2 short range yacht charter classification, and the accommodation layout assures future-proof compliance with the latest crew cabin legislation. Also launching at the Tullett Prebon London International Boat Show 2011, the new Manhattan 73 features a brand-new hull design which allows for space to be maximised throughout and, for the first time, Sunseeker will be offering a joystick manoeuvring system to provide greater control of the vessel when docking. The spacious interior, both in the main and lower deck levels, includes three en suite double cabins, including a full beam midships master suite, together with a fourth twin cabin. The main saloon is situated on one level following right through to the helm position. It includes an adaptable entertainment space, providing ample seating and a separate dining and galley area. It’s flooded with light from the superstructure panoramic windows. The aft deck incorporates luxurious seating, including a table with the option to convert into a ‘daybed’/sunbathing space. Stairs lead to the vast flybridge area which provides great flexibility with two back-to-back areas offering space to dine outside, or to sit back and enjoy the view. Typically of the Manhattan range, performance is paramount. The vessel is expected to perform at speeds in excess of 32 knots, with the larger engine options offering an easy 25 knots. In difficult times, Sunseeker is determined to invest in innovation and new vessels, keeping its ever-growing fan base around the world satisfied. With the firm continuing to prosper, it’s clearly a recipe for success.